As we’ve mentioned before, the Crusaders have another passion other than cupcakes… the theater. So combining the two makes for a perfect evening. On a recent trip to the Everyman Theatre with Crusader Stacy, I stopped in Bohemian Coffee House knowing that they carry Dirty Carrots’ cupcakes. 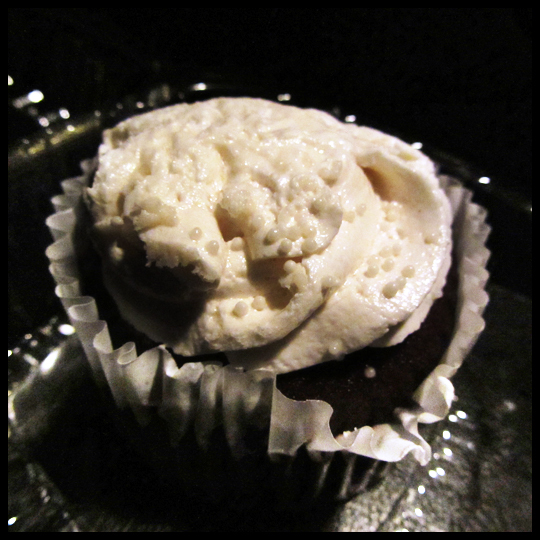 Luckily they had a few left, so I grabbed what I assumed was a chocolate cupcake with vanilla frosting and stashed it in the car for after the show (knowing that theater world tends to frown upon bringing in your own treats). After a great show, which you can always expect at the Everyman Theatre, Stacy and I headed back to my car ready for a cupcake! Since the cupcakes are a really good size, I’d only gotten the one for us to share. Once we bit in we realized that the frosting did not taste like vanilla. We tasted, speculated, and considered a few options thinking that maybe it was a butterscotch or salted caramel buttercream. After looking at their website I think that it was most likely their salted caramel buttercream (because they don’t have butterscotch listed). Honestly, it doesn’t even really matter because it was just so good! I could have eaten tubs of it. I have no idea how you make a vegan buttercream, but this was smooth, rich, not overly sweet, and completely delectable. The cake portion was very chocolaty but more of a muffin consistency, which I anticipated with a vegan cake. Without the frosting it tasted just like a chocolate muffin, however once paired with the icing it didn’t seem to matter anymore and the flavors came together. Once Stacy and I had each consumed our halves, we wanted more. We actually considered going back to Bohemian Coffehouse since they have late night hours. So if you find yourself in front of a Dirty Carrots’ cupcake do not let the vegan aspect scare you. I think that you will be very happy that you gave them a chance! This entry was posted in Baltimore, Cupcakes, Maryland, Vegan and tagged Bohemian Coffee House, butterscotch, Chocolate, Dirty Carrots, salted caramel, Vegan by Crusader Jenn. Bookmark the permalink.